Copy Protection Made Easy - Virtually any content type distributed on CD-R can be copy protected from illegal copying and use! You can create copy protected discs using HexaLock's Virtual Digital Hologram Copy Protection technology. This innovated system is easy and inexpensive to use, and provides full protection against all known pirating techniques. You can even password-protect the discs content! Please note these discs currently ship with a white inkjet printable surface. HexaLock copy protection solutions offer publishers a higher level of available digital copy protection. 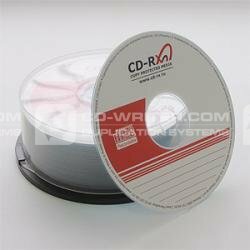 Powerful, easy-to-use to tools allow publishers to create copy protected CD-ROMs and CD-RX discs with excellent compatibility and outstanding resistance to copying software while at the same time providing an exceptionally transparent solution to their end-user customers. Now both program executable file protection and CONTENT FILE protection are available from HexaLock. HexaLock 4th generation copy protection introduced a new advanced security element called Virtual Digital Hologram (VDH), which is being applied to both CD-ROMs and CD-RX, v. 4.0 discs. VDH technology has been in use for over a year exclusively within the military and government sectors. To date, CD's containing VDH technology have proven to be 100% resistant to all copying methods known to HexaLock and its customers. The VDH security element is a digital hologram, formed by special bit patterns that provide a Hologram Effect to the CD/DVD reading device. VDH technology is not an optical hologram, but this is a good model to help explain the way VDH works. By looking on an optical hologram from different angles, the human eye can see different views. If you take a picture of an optical hologram, the 3rd dimension disappears. The result is a 2D picture that represents the view from a specific angle. HexaLock VDH technology is very similar. When making a copy of an original protected disc the VDH pattern will disappear. Instead, a static bit pattern will appear. The HexaLock software will detect absence the VDH pattern and act accordingly. HexaLock's 4th generation copy protection provides both outstanding resistance to copying software and equipment and also increased compatibility and performance with all tested hardware and software configurations. Virtually any content type distributed on CD-R can be copy protected from illegal copying and use! You can create copy protected discs using HexaLock's Virtual Digital Hologram Copy Protection technology. This innovated system is easy and inexpensive to use, and provides full protection against all known pirating techniques. You can even password-protect the discs content! Excellent resistance to copying software Serialization and tracking information possible Advanced anti-cracking techniques Polymorphic encryption process Conforms to the Orange Book Standards Compatible with standard CD recorders Patent Pending Technology All you have to do is download the free software at Hexalock Wizard Registration, and use pre-formatted HexaLock CD-RX discs to record on a Windows-based PC. All program executable files. PDF documents (PDF) for use with Adobe Acrobat applications. Internet files (HTM, HTML, PNG, XML, etc.) for use with Microsoft Internet Explorer and Mozilla FireFox. MS PowerPoint presentations (PPS, PPT) for use with the free MS PowerPoint 97-2000+ Viewer (fully embedded presentations only-No linked external files.) MS Word files (DOC) for use with the free MS Word Viewer. Macromedia SWF, FLV files for use with Microsoft Internet Explorer (typically embedded into HTML files), ACDSee v, 5,6,7, Kodak Preview viewers and Director exe files. Macromedia Director compiled executables using the following file types: DWI, DXR. Picture files (JPG, JPEG, BMP, GIF, TIF, TIFF) for use in Windows Picture Viewer. Audio/Video Media files (AVI, MPG, MPEG, WMV, WAV, WMA, MP3, ASF, SWF) for use in Microsoft Media Player, WinAmp, DiVX Player, Flash based plug-ins for supported Internet browsers. Streaming Video/Audio files (RM, SC, SMI, MOV, RV, RMVB) for use in RealPlayer and QuickTime Player applications. RTF text files for use with Windows Notepad, Windows WordPad. HTA script files for MS HTA application. DICOM (DIC) files for use with DicomWorks and ezDicom applications. The CD-RX software writes a 20MB session to the disc before writing content, so the total capacity of the recordable disc is reduced by 20MB. *Protected audio files will play on the PC, but not in consumer players. Hexalock . CD-RX . CD . discs . of . copy . protection . - . 100 . pack .